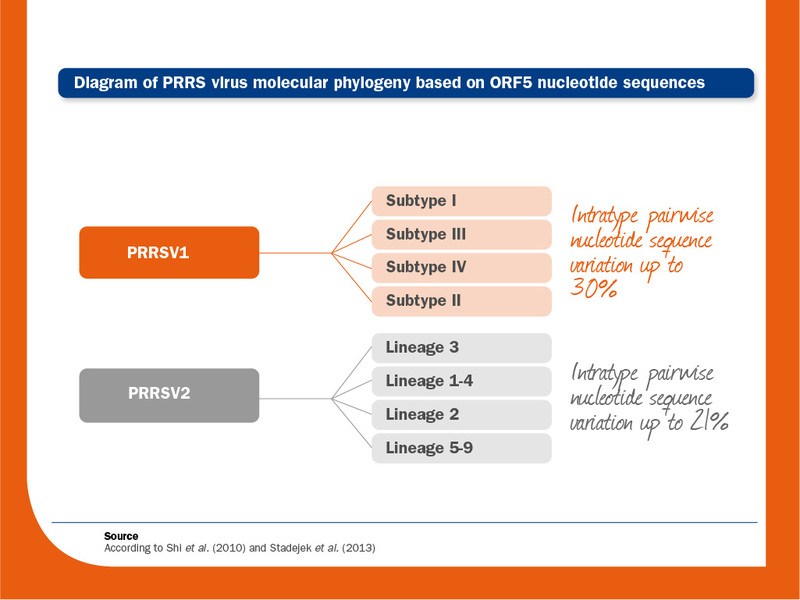 Since the beginning, two PRRS virus genotypes were established: European or Type 1 (prototype Lelystad virus) and North American or Type 2 (prototype VR-2332). Interestingly, similarity between both prototype nucleotide sequences is as low as 55%. In fact, they have been recently considered as two different viral species: PRRSV1 and PRRSV2 (International Committee on Taxonomy of Viruses (ICTV). More importantly, intraspecific pairwise nucleotide sequence variation exceeds 20% (up to 30% in PRRSV1 and around 21% in PRRSV2). One hallmark of PRRS virus is its extremely high genetic diversity. A significant quantity of subtypes or clades has been identified in both species. Within PRRSV1, there are at least 4 different subtypes; subtype I is predominant in Western Europe, whereas subtypes II-IV are isolated only in countries eastwards of Poland. It seems that genetic variability within subtypes II-IV is higher than within subtype I (18.2% vs. 11.9% using ORF5, respectively). Regarding PRRSV2, although subtypes have not been clearly defined, several lineages exist in two well-defined clades; seven lineages made up by North American isolates and two lineages exclusively consisting of isolates from South East Asia. It has been described that the allocation of genetic diversity is not constant along the PRRS virus genome. Thus, ORF1a, ORF3 and ORF4 seems to be more diverse. It is important to note that the phylogenetic analyses aimed to determine subtypes and lineages have generally been based on ORF5, which represents a low percentage of the viral genome. It cannot be ruled out that this classification may change in the future when considering the whole genome. Allende R, Laegreid WW, Kutish GF, Galeota JA, Wills RW, Osorio FA. Porcine reproductive and respiratory syndrome virus: description of persistence in individual pigs upon experimental infection. J Virol. 2000, 74:10834-7. Allende R, Kutish GF, Laegreid W, Lu Z, Lewis TL, Rock DL, Friesen J, Galeota JA, Doster AR, Osorio FA. Mutations in the genome of porcine reproductive and respiratory syndrome virus responsible for the attenuation phenotype. Arch Virol. 2000, 145:1149-61. Brockmeier SL, Loving CL, Palmer MV, Spear A, Nicholson TL, Faaberg KS, Lager KM. Comparison of Asian porcine high fever disease isolates of porcine reproductive and respiratory syndrome virus to United States isolates for their ability to cause disease and secondary bacterial infection in swine. Vet Microbiol. 2017, 203:6-17. Chang CC, Yoon KJ, Zimmerman JJ, Harmon KM, Dixon PM, Dvorak CM, Murtaugh MP. Evolution of porcine reproductive and respiratory syndrome virus during sequential passages in pigs. J Virol. 2002, 76:4750-63. Darwich L, Gimeno M Sibila M, Diaz I, de la Torre E, Dotti S, Kuzemtseva L, Martin M, Pujols J, Mateu E. Genetic and immunobiological diversities of porcine reproductive and respiratory syndrome genotype I strains. Vet Microbiol. 2011, 150:49-62. Dea S, Gagnon CA, Mardassi H, Pirzadeh B, Rogan D. Current knowledge on the structural proteins of porcine reproductive and respiratory syndrome (PRRS) virus: comparison of the North American and European isolates. Arch Virol. 2000, 145:659-88. Dokland T. The structural biology of PRRSV. Virus Res. 2010, 154:86-97. Dunowska M1, Biggs PJ, Zheng T, Perrott MR. Identification of a novel nidovirus associated with a neurological disease of the Australian brushtail possum (Trichosurus vulpecula). Vet Microbiol. 2012, 156:418-24. Frydas IS, Nauwynck HJ. Replication characteristics of eight virulent and two attenuated genotype 1 and 2 porcine reproductive and respiratory syndrome virus (PRRSV) strains in nasal mucosa explants. Vet Microbiol. 2016, 182:156-62. Frydas IS, Trus I, Kvisgaard LK, Bonckaert C, Reddy VR, Li Y, Larsen LE, Nauwynck HJ. Different clinical, virological, serological and tissue tropism outcomes of two new and one old Belgian type 1 subtype 1 porcine reproductive and respiratory virus (PRRSV) isolates. Vet Res. 2015, 46:37. Gimeno M, Darwich L, Diaz I, de la Torre E, Pujols J, Martín M, Inumaru S, Cano E, Domingo M, Montoya M, Mateu E. Cytokine profiles and phenotype regulation of antigen presenting cells by genotype-I porcine reproductive and respiratory syndrome virus isolates. Vet Res. 2011, 18:42:9. Goldberg TL1, Lowe JF, Milburn SM, Firkins LD. Quasispecies variation of porcine reproductive and respiratory syndrome virus during natural infection. Virology. 2003, 317:197-207. Halbur P, Bush E. Update on abortion storms and sow mortality. Swine Health Prod. 1997, 5:73. Han J, Wang Y, Faaberg KS. Complete genome analysis of RFLP 184 isolates of porcine reproductive and respiratory syndrome virus. Virus Res. 2006, 122:175-82. Virus taxonomy: classification and nomenclature of viruses: Ninth Report of the International Committee on Taxonomy of Viruses. Ed: King AMQ, Adams MJ, Carstens EB, Lefkowitz EJ. Elsevier Academic Press. 2012. Johnson CR, Griggs TF, Gnanandarajah J, Murtaugh MP. Novel structural protein in porcine reproductive and respiratory syndrome virus encoded by an alternative ORF5 present in all arteriviruses. J Gen Virol. 2011, 92:1107-16. Le Gall A, Albina E, Magar R, Gauthier JP. Antigenic variability of porcine reproductive and respiratory syndrome (PRRS) virus isolates. Influence of virus passage in pig. Vet Res. 1997, 28:247-57. Kapur V, Elam MR, Pawlovich TM, Murtaugh MP. Genetic variation in porcine reproductive and respiratory syndrome virus isolates in the midwestern United States. J Gen Virol. 1996, 77:1271-6. Kuhn JH, Lauck M, Bailey AL, Shchetinin AM, Vishnevskaya TV, Bào Y, Ng TF, LeBreton M, Schneider BS, Gillis A, Tamoufe U, Diffo Jle D, Takuo JM, Kondov NO, Coffey LL, Wolfe ND, Delwart E, Clawson AN, Postnikova E, Bollinger L, Lackemeyer MG, Radoshitzky SR, Palacios G, Wada J, Shevtsova ZV, Jahrling PB, Lapin BA, Deriabin PG, Dunowska M, Alkhovsky SV, Rogers J, Friedrich TC, O’Connor DH, Goldberg TL. Reorganization and expansion of the nidoviral family Arteriviridae. Arch Virol. 2016, 161:755-68. Lee C, Yoo D. The small envelope protein of porcine reproductive and respiratory syndrome virus possesses ion channel protein-like properties. Virology. 2006, 355:30-43. Martelli P, Cordioli P, Fallacara F, Gozio S, Terreni M, Cavirani S. A follow up study of recurrent acute PRRS (Atypical PRRS-SAMS) and genetic variations of ORF5. In Proceedings of the 4th International Symposium on Emerging and Re-emerging Pig Diseases, 75-76, 2003, Italy. Martín-Valls GE, Kvisgaard LK, Tello M, Darwich L, Cortey M, Burgara-Estrella AJ, Hernández J, Larsen LE, Mateu E. Analysis of ORF5 and full-length genome sequences of porcine reproductive and respiratory syndrome virus isolates of genotypes 1 and 2 retrieved worldwide provides evidence that recombination is a common phenomenon and may produce mosaic isolates. J Virol. 2014, 88:3170-81. Mengeling WL, Lager KM, Vorwald AC. Clinical consequences of exposing pregnant gilts to strains of porcine reproductive and respiratory syndrome (PRRS) virus isolated from field cases of “atypical” PRRS. Am J Vet Res. 1998, 59:1540–4. Meulenberg JJ, Petersen den Besten A, de Kluyver E, van Nieuwstadt A, Wensvoort G, Moormann RJ. Molecular characterization of Lelystad virus. Vet Microbiol. 1997, 55:197-202. Morgan SB, Frossard JP, Pallares FJ, Gough J, Stadejek T, Graham SP, Steinbach F, Drew TW, Salguero FJ. Pathology and virus distribution in the lung and lymphoid tissues of pigs experimentally inoculated with three distinct type 1 prrs virus isolates of varying pathogenicity. Transbound Emerg Dis. 2014. doi: 10.1111/tbed.12272. Morgan SB, Graham SP, Salguero FJ, Sánchez Cordón PJ, Mokhtar H, Rebel JM, Weesendorp E, Bodman-Smith KB, Steinbach F, Frossard JP. Increased pathogenicity of European porcine reproductive and respiratory syndrome virus is associated with enhanced adaptive responses and viral clearance. Vet Microbiol. 2013, 163: 13-22. Murtaugh MP, Elam MR, Kakach LT. Comparison of the structural protein coding sequences of the VR-2332 and Lelystad virus strains of the PRRS virus. Arch Virol. 1995, 140:1451-60. Murtaugh MP, Yuan S, Faaberg KS. Appearance of novel PRRSV isolates by recombination in the natural environment. Adv Exp Med Biol. 2001, 494:31-6. Music N, Gagnon CA. The role of porcine reproductive and respiratory syndrome (PRRS) virus structural and non-structural proteins in virus pathogenesis. Anim Health Res Rev. 2010, 11:135-63. Oleksiewicz MB, Stadejek T, Maćkiewicz Z, Porowski M, Pejsak Z. Discriminating between serological responses to European-genotype live vaccine and European-genotype field strains of porcine reproductive and respiratory syndrome virus (PRRSV) by peptide ELISA. J Virol Methods. 2005, 129:134-44. Rowland RR, Steffen M, Ackerman T, Benfield DA. The evolution of porcine reproductive and respiratory syndrome virus: quasispecies and emergence of a virus subpopulation during infection of pigs with VR-2332. Virology. 1999, 259:262-6. Shi M, Lam TT, Hon CC, Hui RK, Faaberg KS, Wennblom T, Murtaugh MP, Stadejek T, Leung FC. Molecular epidemiology of PRRSV: a phylogenetic perspective. Virus Res. 2010, 154:7-17. Sinn LJ, Zieglowski L, Koinig H, Lamp B, Jansko B, Mößlacher G, Riedel C, Hennig-Pauka I, Rümenapf T. Characterization of two Austrian porcine reproductive and respiratory syndrome virus (PRRSV) field isolates reveals relationship to East Asian strains. Vet Res. 2016, 47:17. Snijder EJ, Meulenberg JJ. The molecular biology of arteriviruses. J Gen Virol. 1998, 79:961-79. Snijder EJ, Dobbe JC, Spaan WJ. Heterodimerization of the two major proteins is essential for arterivirus infectivity. J Virol. 2003, 77:97-104. Snijder EJ, Kikkert M, Fang Y. Arterivirus molecular biology and pathogenesis. J Gen Virol. 2013, 94:2141-63. Spilman MS, Welbon C, Nelson E, Dokland T. Cryo-electron tomography of porcine reproductive and respiratory syndrome virus: organization of the nucleocapsid. J Gen Virol. 2009, 90:527-35. Stadejek T, Oleksiewicz MB, Potapchuk D, Podgórska K. Porcine reproductive and respiratory syndrome virus strains of exceptional diversity in Eastern Europe support the definition of new genetic subtypes. J Gen Virol. 2006, 87:1835-41. Stadejek T, Stankevicius A, Murtaugh MP, Oleksiewicz MB. Molecular evolution of PRRSV in Europe: current state of play. Vet Microbiol. 2013, 165:21-8. Sun L, Li Y, Liu R, Wang X, Gao F, Lin T, Huang T, Yao H, Tong G, Fan H, Wei Z, Yuan S. Porcine reproductive and respiratory syndrome virus ORF5a protein is essential for virus viability. Virus Res. 2013, 171:178-85. Tian D, Wei Z, Zevenhoven-Dobbe JC, Liu R, Tong G, Snijder EJ, Yuan S. Arterivirus minor envelope proteins are a major determinant of viral tropism in cell culture. J Virol. 2012, 86:3701-12. Truong HM, Lu Z, Kutish GF, Galeota J, Osorio FA, Pattnaik AK. A highly pathogenic porcine reproductive and respiratory syndrome virus generated from an infectious cDNA clone retains the in vivo virulence and transmissibility properties of the parental virus. Virology. 2004, 325:308–19. Van Vugt JJ, Storgaard T, Oleksiewicz MB, Bøtner A. High frequency RNA recombination in porcine reproductive and respiratory syndrome virus occurs preferentially between parental sequences with high similarity. J Gen Virol. 2001, 82:2615-20. Wang X, Marthaler D, Rovira A, Rossow S, Murtaugh MP. Emergence of a virulent porcine reproductive and respiratory syndrome virus in vaccinated herds in the United States. Virus Res. 2015, 210:34-41. Weiland E, Wieczorek-Krohmer M, Kohl D, Conzelmann KK, Weiland F. Monoclonal antibodies to the GP5 of porcine reproductive and respiratory syndrome virus are more effective in virus neutralization than monoclonal antibodies to the GP4. Vet Microbiol. 1999, 66:171-86. Wissink EH, Kroese MV, van Wijk HA, Rijsewijk FA, Meulenberg JJ, Rottier PJ. Envelope protein requirements for the assembly of infectious virions of porcine reproductive and respiratory syndrome virus. J Virol. 2005, 79:12495-506. Zhao K, Ye C, Chang XB, Jiang CG, Wang SJ, Cai XH, Tong GZ, Tian ZJ, Shi M, An TQ. Importation and Recombination Are Responsible for the Latest Emergence of Highly Pathogenic porcine reproductive and respiratory syndrome virus in China. J Virol. 2015, 89:10712-6.